Five weeks is too long to go without seeing a good friend. Especially when that friend lives only forty-five minutes away. What is it about driving in and out of the city that seems so daunting? But it was finally remedied this Saturday, with a train ride, a car ride, and a stretched-long day. It was the sort of day where you never stop talking, and then, as dinner gets closer, you’re exhausted by the talk. We looked at each other, and we were speechless. Finally. What does it take to make the perfect day? Coffee shops – with strong coffee, an array of hipsters and business people and grandmas and grandpas talking about who was making the green bean casserole for Thanksgiving. People watching – this can be done in silence or with conversation, depending on your mood. Used Bookshops – these are a must. 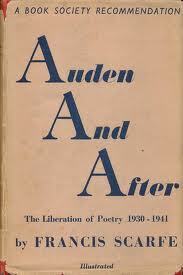 Find a beautiful hardcover about W. H. Auden for $8 and carry it in your purse for days because you hope to find five minutes to read it. Roast beef and reuben sandwiches – duh. Random parades – run to watch the parade of cars, trucks, police cars and screaming people. Because winning the state championship for your high school football team is pretty awesome, and yelling out your car, blasting your horn, and feeling like you own the world are the best ways to celebrate. Sitting in fake wooden boats – yes, do this, even though it seems odd. It’s best to sit in said wooden boat until it gets dark, laughing so loudly that the people walking by raise their eyebrows. Tell each other they’re jealous of your joy. Too much can happen in five weeks to be talked about in one day. 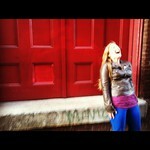 But there’s never too much to laugh about. This entry was posted in out and about, the good things, travel and tagged blessings, books, city life, new places, walks on November 22, 2012 by catherine_hawkins. I’m writing from a brown leather couch in the middle of America. Haven’t taken a single picture yet, and that’s likely to remain unchanged…unless my friend takes a couple. I didn’t bring a camera (shame on me), but I did bring a stack of good books (Tim Keller’s Reason for God, Anne Sexton’s poetry [yes, still plugging away/reveling], and a novel called The Particular Sadness of Lemon Cake). I read on the plane ride, but there is too much to do here to really sit down and devote myself to a book. Here’s a late-addition from my walk around the museum. So how am I writing right now, you ask? Because my friends are still sleeping. I woke up early to cars and trucks out the window, the sound of sidewalk sweeping, the smell of already-hot-sun-on-brick. It’s 86 degrees here in Chicago, and, while I am proud of my friends for their economy-savvy, I now realize the beauty of air conditioning. It’s good training, though, for when I get my own place; judging from my past budgeting choices, things like air conditioning won’t make the cut. Little apartments are perhaps the best thing ever. I walked in and immediately felt at home. Wood floors, large kitchen, open windows lining the street. Books and books everywhere because M. was an English major, and we English majors feel the need to remind everyone by the stacks that line our walls. It’s fun to see how people grow up – I’ve know L. since 8th grade when we sang in choir together. Now, I get to see her new life, her adventure into adulthood. The brief trips she’s taken to come back home cannot show you a person’s new life, really. Today consists of a trip to the Bean. Don’t even know what this is, but everyone back home was like “See the bean,” and even here, my friends, the anti-tourists, claim that yes, it should be seen. Then a delicious solo-trip to the art museum while L. works at the theater for the afternoon. I can’t tell you how excited I am for that. This whole three-day excursion is smelling remarkably like Austria, and I can thank my experience there for allowing me to navigate this new city with less angst than I’ve ever traveled before. And proof of the trip to the Bean. This entry was posted in out and about, road to freedom, travel and tagged blessings, city life, midwest, new places, travel on July 17, 2012 by catherine_hawkins. Back from a week of the midwest. How’d I do with my list? Of course this happened, but it’s always harder for me to write when there is so much to look at and experience. What if I miss something?! The real writing comes later. We got lost on the way home from the airport (not so shocking to people who know us), and we talked the entire time. And didn’t really stop until the last hug at the Tulsa airport three days later. A lot happens in two years, but it’s amazing how you immediately fall back into the way things always were. Yes, I consumed both sushi and barbecue while in OK. I didn’t even have to ask for them. Now that’s good hosting. Went to church. A lot. Early service in chairs in a make-shift sanctuary while the real sanctuary is being renovated. Then on to Sunday School (and yes, people are interesting/weird/lovable wherever you go). Then to help out in children’s church. I have a new appreciation for people who work with children. The patience those helpers exhibited could only come from God. Then at 6:30 there was evening church. The evening sermon was thought-provoking, and on the way home we got burgers. A good ending. Um, St. Louis closes down on Mondays. No art museums were open! But my girlfriends and a husband and I rode the tram up to the arch and looked out over the city. While we waited to go up, we strolled through the Lewis and Clark museum, so I guess that can count. The tram was like a little capsule for five people. We only had four in our group, so some unsuspecting bald man had to squeeze in with us. And the three of us girls sure know how to be annoying when we’re happy. Poor guy. And I come home, a little more broke than when I left. But who’s complaining? Too many good memories to care. The anticipation of travel has me floating through my days, unbelievably excited and unbelieving in God’s blessings. A whole week to see new things. A whole week to talk and laugh with people I love and who love me. A whole week to be a little bit of someone I’m not. You can recreate yourself every time you step foot in a new place, and that is maybe why I love it so much. After a few days in Oklahoma, I’m flying up to St. Louis to stay with an old friend. I was worried at first: what do I tell him when he asks what I’m doing with my life? Do I admit that I still don’t know? Do I talk about the glories of retail? He’s not the kind of person to expect cookie-cutter people, but I didn’t want to present myself sadly or pityingly, even if I sometimes feel that way. Now, though, I have an answer. I got accepted into the TEFL program, starting in May. Oh the joy and relief of knowing the next step in life! So, on to the midwest I go! Some photos from my summer in Austria. Just too beautiful not to keep looking at! I wonder if the photos from this trip will be able to compare?! This entry was posted in out and about, travel and tagged midwest, new places, travel on February 10, 2012 by catherine_hawkins.